Appigo raises the bar for productivity apps on the iPhone by introducing a full landscape calendar and multi task operations in their latest release of Todo. With multi task mode our users spend less time organizing and more time getting things done. 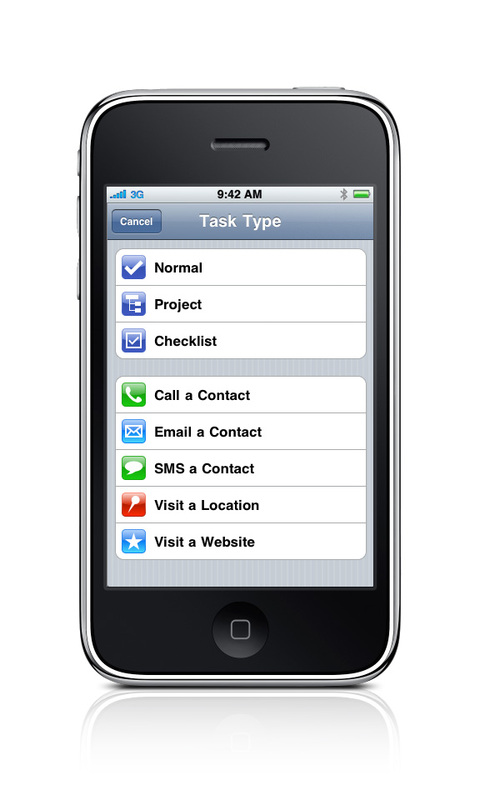 Appigo, Inc., a worldwide leader of high quality iPhone applications, just released their most innovative version of Todo™, their to-do list for the iPhone and iPod touch, which is now available on the iTunes App Store. Todo 3.2 sports a new multi task mode, allowing customers to modify multiple tasks at once. Additionally, every screen in the app supports the iPhone's landscape mode, which makes text entry easier with a larger sized keyboard. "A lot of people think they need a desktop application to manage hundreds of tasks because they've never had a complete solution on their phone," said Calvin Gaisford, President and Co-Founder of Appigo, Inc., "With multi task mode our users spend less time organizing and more time getting things done." 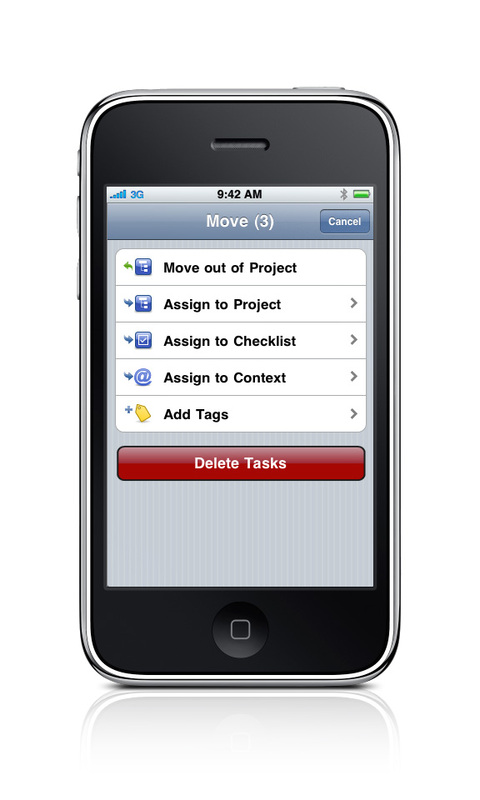 Appigo continues to drive to-do list innovation with their latest update of Todo. Instead of modifying tasks one by one, for example, users can now select multiple tasks and schedule them all at once or reassign them for simple organization. Todo's landscape calendar has a special toolbar which slides out of the way to provide more room for months which span six weeks. 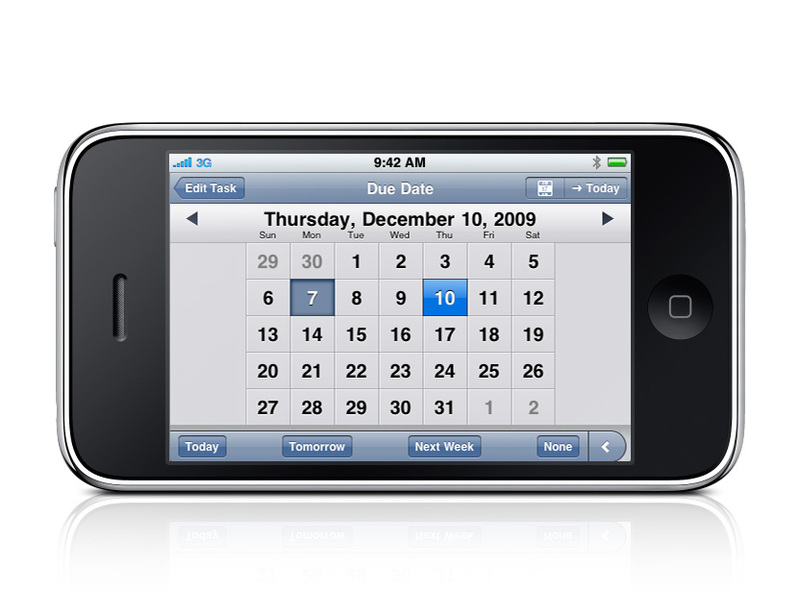 The due date calendar allows users to quickly choose a due date for their tasks. 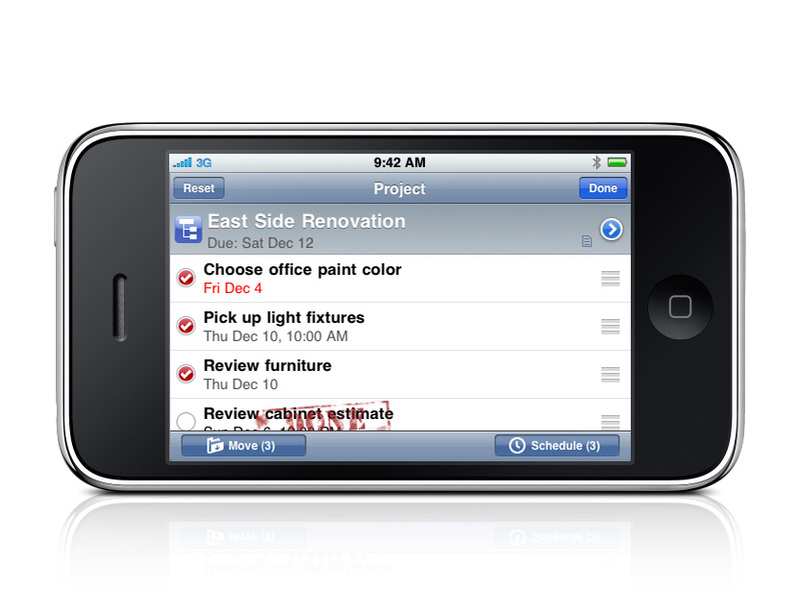 Appigo is known for being the first to introduce to-do list innovations for the iPhone. 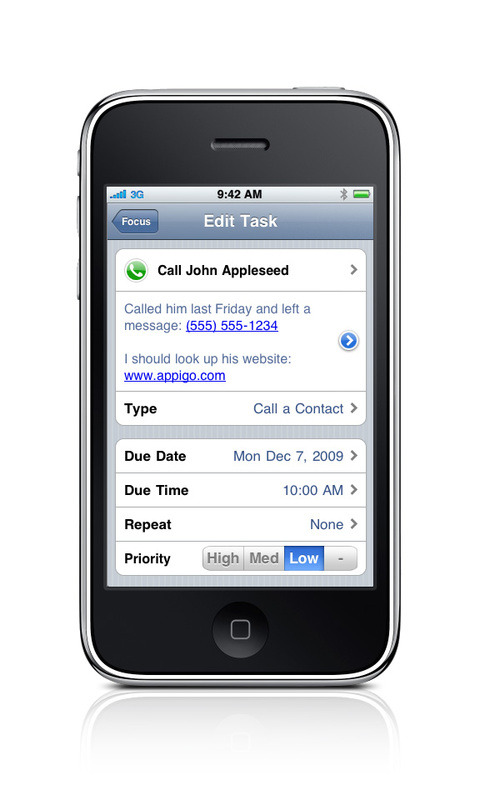 When the iTunes App Store first opened, Appigo's Todo set the standard by providing task synchronization with two popular online services, Remember The Milk and Toodledo. 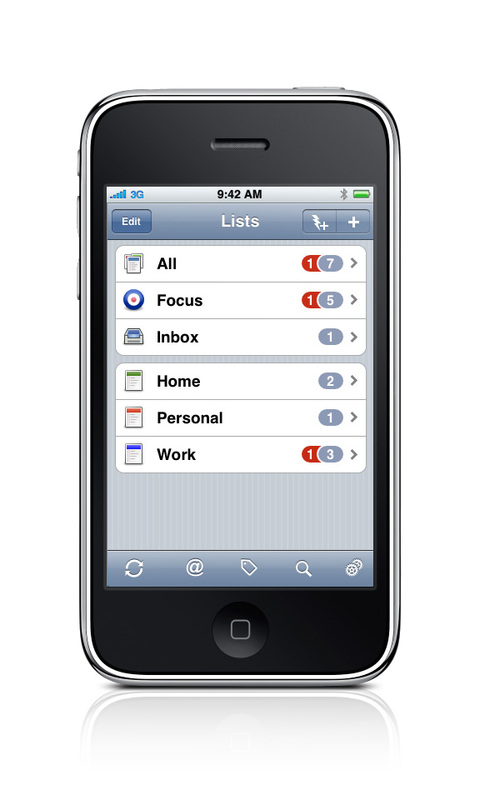 Appigo also introduced features like quick add, repeating tasks, and integration with other iPhone apps. Appigo added Mac OS X iCal task synchronization at the beginning of 2009, which has become very popular. In August, Appigo provided task alerts using Apple's Push Notification Service, which continues to service thousands of reminder alerts every day. In October, Appigo released a beta version of Appigo Sync for Windows, a synchronization tool for Microsoft Outlook tasks making Todo the most connected to-do list on the App Store. Appigo Todo is available on the iTunes App Store for $9.99. A free version of Todo is also available on the App Store for iPhone and iPod touch users to get a feel of how Todo works. Users of Todo Lite can create up to ten standard tasks and five subtasks in a project or checklist. All features of the full version of Todo are provided in Todo Lite. With a strong focus on customer satisfaction, Appigo raises the bar again for all iPhone apps. The company plans to continue innovation in Todo and its other iPhone applications with enhanced features. Notebook™, Appigo's note organization app, was recently updated and provides users with import and export from Todo. An update of Appigo's AccuFuel™ app, a fuel-efficiency tracker, will also receive an update soon. Todo 3.2 requires iPhone OS 3.1 or later. Appigo Todo ($9.99), Notebook ($4.99), and AccuFuel ($0.99) can each be purchased directly on the iTunes App Store. Todo Lite is available as a free download on the iTunes App Store. Appigo Sync is available as a free download from Appigo's website. Appigo, Inc., develops high quality applications for the exciting iPhone computing platform including Todo (powerful task management), Notebook (notes available everywhere), and AccuFuel (fuel efficiency tracker). With many years of experience in mobile computing, networking and user interface design, the Appigo team focuses on adding polish to its applications for a more enjoyable end-user experience. The products created by Appigo have quickly gained favorable reviews worldwide. For additional information about Appigo and their products, including full demonstration videos, please visit their website. Appigo, Appigo Todo, Appigo Notebook, Appigo AccuFuel, the respective app icons, and the Todo 3 logo are trademarks of Appigo, Inc. Copyright 2008-2009, Appigo, Inc. All rights reserved. Apple, the Apple logo, iPod, iPod touch, and iTunes are trademarks of Apple Inc., registered in the U.S. and other countries. iPhone is a trademark of Apple Inc. App Store is a service mark of Apple Inc. Other company and product names may be trademarks of their respective owners. Appigo Todo uses the Remember the Milk API but is not endorsed or certified by Remember The Milk. 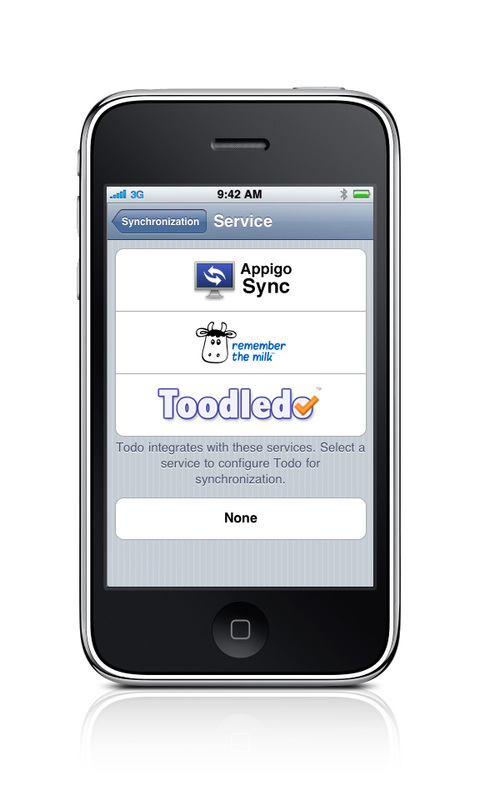 Appigo Todo uses the Toodledo API but is not otherwise affiliated with Toodledo. Todo Task ListsThis screenshot shows the task lists screen in Todo. Users can create as many task lists as they wish to help organize their tasks. Landscape Task ListsThis screenshot shows the landscape version of the task lists screen. Multi Move ModeThis shows Todo in multi move mode and three tasks are selected. Landscape Multi Move ModeThis is the landscape version of multi move mode where users can operate on multiple tasks in one step. Multi Move OptionsShown are some of the multi move operations available when selecting multiple tasks. 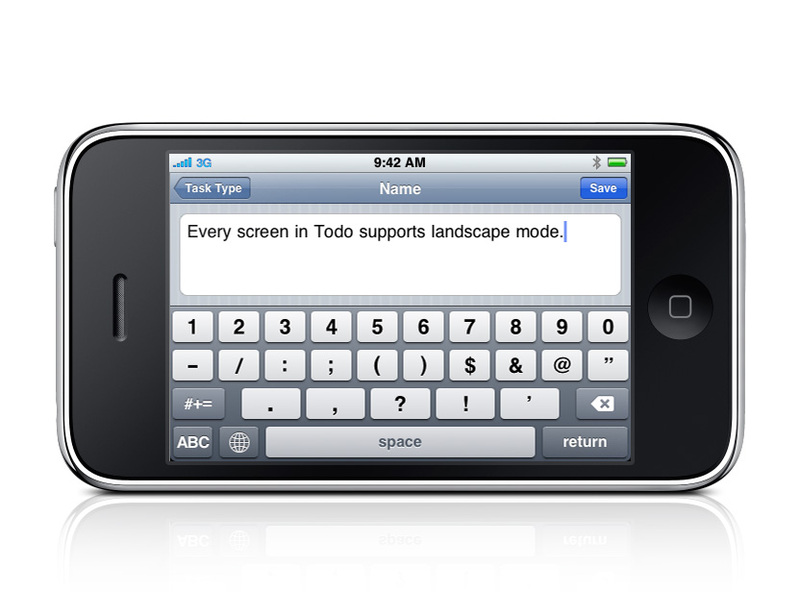 Full Landscape KeyboardTodo provides a full landscape keyboard during task entry. Task Type OptionsA variety of built-in task types are available in Todo. 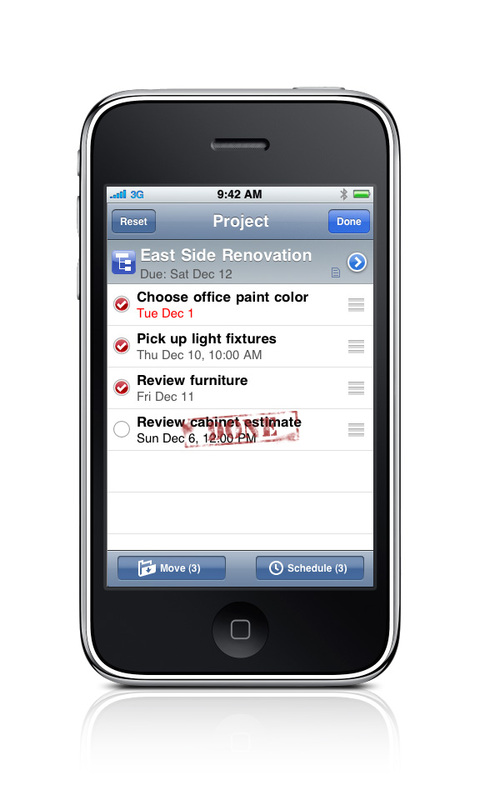 Task Details with Clickable LinksClickable phone numbers and URLs are automatically highlighted in the task's note. Full Landscape CalendarA task's due date can be selected in both portrait and landscape mode using a full calendar. 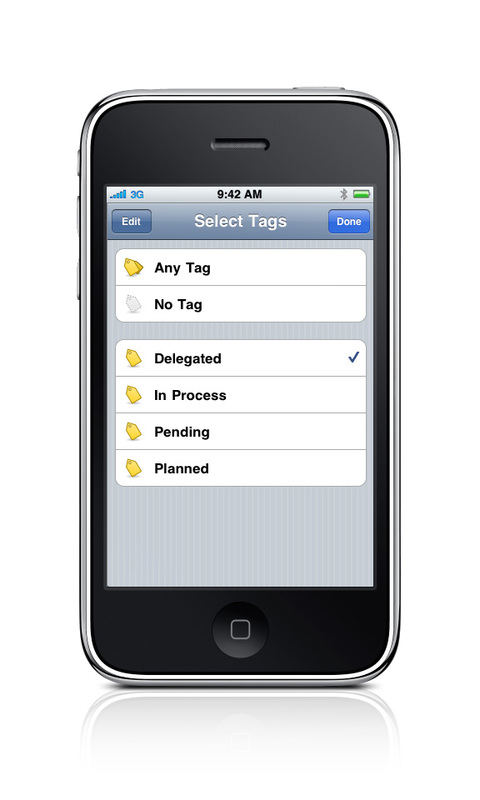 TagsUser-defined tags are used for customized organization. ContextsUser-defined contexts allow custom organization in Todo. Synchronization OptionsTodo offers a wide variety of task synchronization options including iCal and Microsoft Office (uses Appigo Sync), Toodledo, and Remember The Milk.